Over their time together, Big Sean and Jhené Aiko have had some hilarious moments together. The two regularly engage in harmless joking and flirting on social media so when it was revealed that the two had unfollowed each other on Instagram, many people assumed the worst in their relationship. 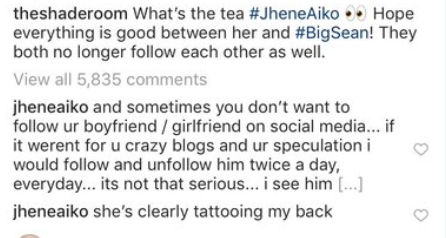 New additions to her Instagram story seemed to hint at an imminent break-up announcement between her and Big Sean but, alas, much like the rumor mill was instantly shut down in March, Jhené has spoken out about all the speculation. After some cryptic Instagram posts, Jhené took down her Instagram story and commented on a post that has since been deleted by The Shade Room. The post assumed that the couple had split and the singer wrote underneath, "Sometimes you don’t want to follow ur boyfriend/girlfriend on social media..." Clarifying that she has not broken up with Sean, Aiko continued, "If it werent for u crazy blogs and ur speculation I would follow and unfollow him twice a day, everyday…it’s not that serious….I see him enough in real life and on my arm." Many believed that the singer was getting her tattoo of Big Sean's face covered up, while the star revealed she was actually getting work done on her "moon phases and the rising sun on [her] back." Phew. Now that all this is cleared up, we go back to wondering what Big Sean is cooking up. He posted a photo in the studio yesterday as he has been doing for much of the year, teasing upcoming music. We'll keep an eye out for any news on the couple.